In the Yucatan of Mexico, one can often enjoy a half of fresh orange sprinkled with chili pepper offered by street vendors. The mixture of sweet and hot is always enjoyable. This recipe is a delight for the taste buds. Steam the sprouts above boiling water for 5-8 minutes. Place the orange juice plus the corn starch in a sauce pan, mix well and bring to heat. Add the orange zest, chili flakes, butter and seasoning. (reserve a bit of zest as garnish. Stir until thick and clear. When the sprouts are soft, but still bright green, remove and place in a serving dish. Drizzle the orange chili sauce over the sprouts and place the zest around. 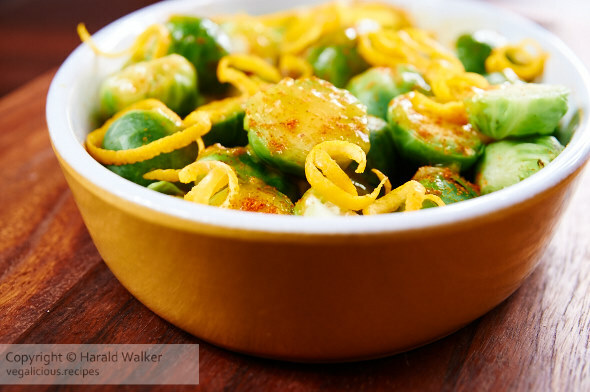 Posted by Chris Walker on December 15, 2008 in Brussels sprouts, Orange, Side Dishes.